The modern kamado-style grill is based on ancient technology. The earliest cooking vessels were made of clay and found in China, dated to be over 3,000 years old. All over the world these cooking vessels evolved in many different ways, and in Japan a clay pot with a removable dome lid became popular. This device was called a "mushikamado" and it included a damper and draft door for better heat control. It also was fueled by charcoal rather than wood. The mushikamado was introduced to Americans after the Second World War. Eventually, it became known as a "kamado" which literally means "cooking range" or "stove" in Japanese. 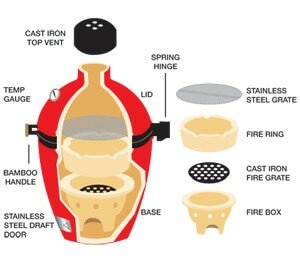 Most modern kamado grills are made from ceramics. The use of ceramics has many advantages over other materials, mainly the excellent heat retention. Ceramic grills can retain heat for long periods of time, making them extremely versatile as they can be used for grilling, smoking, and baking. Kamados can reach consistent temperatures as low as 225° F and as high as 750°+ F. Using the vent system, precise control of airflow can be maintained, allowing kamados to function much like wood-fired ovens and they can be used to roast or bake anything. The use of modern ceramics also ensures that kamados seldom crack, which was a common fault in the original Japanese design. Blaze Outdoor Products has recently introduced the industry's first indestructible kamado grill made from solid cast aluminum. The innovative design provides unparalleled durability, greater mobility, and the same outstanding consistent temperature control. Its unique tongue and groove design, molded exhaust cap, and non-porous body are sure to impress. See for yourself - the BLAZE KAMADO, it's JUST THAT TOUGH. Today, kamado grills can be found in many backyards across the country. The most popular kamado brands are Blaze, Kamado Joe, Primo Ceramic Grills, Grill Dome, and Big Green Egg. Knowing the differences between the brands can be tricky given that the grills are very similar in size and construction. To make it easier to learn the details of all the brands, we've compiled a handy Kamado Grills Comparison Chart for you to use as a reference. If you would like to learn more about how kamado grills differ from traditional charcoal grills, please visit our Kamado Grills vs. Charcoal page.